Say it with flowers. 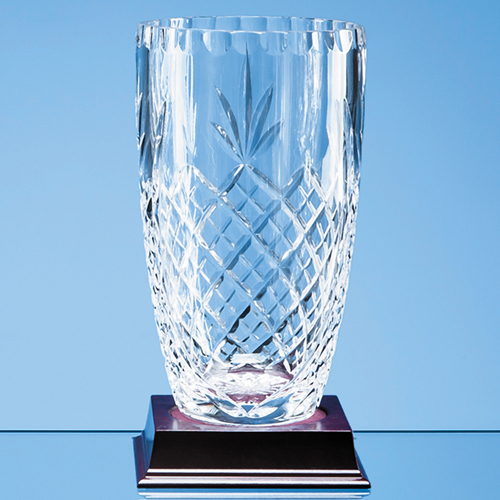 This beautiful 23cm lead crystal panelled barrel vase will grace any sideboard, mantelpiece or awards cabinet with elegance and charm. With a classic diamond and wedge cut design and incorporating space to engrave a special message, logo or crest it doubles as a corporate recognition award, sports trophy or to commemorate a special event or occasion - whether a birthday, retirement, anniversary. Available as an option is a beautiful presentation box with blue satin lining. Optionally available also is an 8cm recessed wooden base (MOR23) to stand it in.